Krasimir Simeonov was born in Sofia on January 20, 1963. He was judo and sambo competitor for twenty years. He hold the title of Mater of sport and has numerous medals won at national, European, and world championships. A key moment in his life is his first participation in the cinema as rider, when working on the movie “The Golden Age” in 1981. Then he felt he would like to work with horses but the time was not right. He was conscripted and had more years of professional sport competitive career. The participation of Krasimir Simeonov in the French-Canadian production Vercingеtorix, with Christopher Lambert in the title role, marked the beginning of long and exciting work in the film industry. And this work is closely linked to the adrenalin fueled actions of stuntmen. Krasimir received a gift – videocassette with the work of the French cinema horse trainer – Mario Lurachi (horse master) during the filming of the movie Caesar in 2002. This was the spark that ignited the flame to work with horses. Mario Lurachi became an idol for Krasimir for his abilities to successfully perform amazing stunts, at the limit of possibilities of man and horse. The professional sport training, everyday exercises and the everlasting pursuit of perfection give results. Since the year 2000, Krasimir Simeonov has taken part in almost 100 foreign and Bulgarian film productions. He was one of the Bulgarian stuntmen chosen to participate in the epic war film Troy (2003 – with Brad Pitt as leading actor). Amongst the most popular movies, in which Krasimir participated were The Black Dahlia (2006), Hannibal (2006), Conan the Barbarian (2011), Expendables 2 (2012), Expendables 3 (2014), etc.. 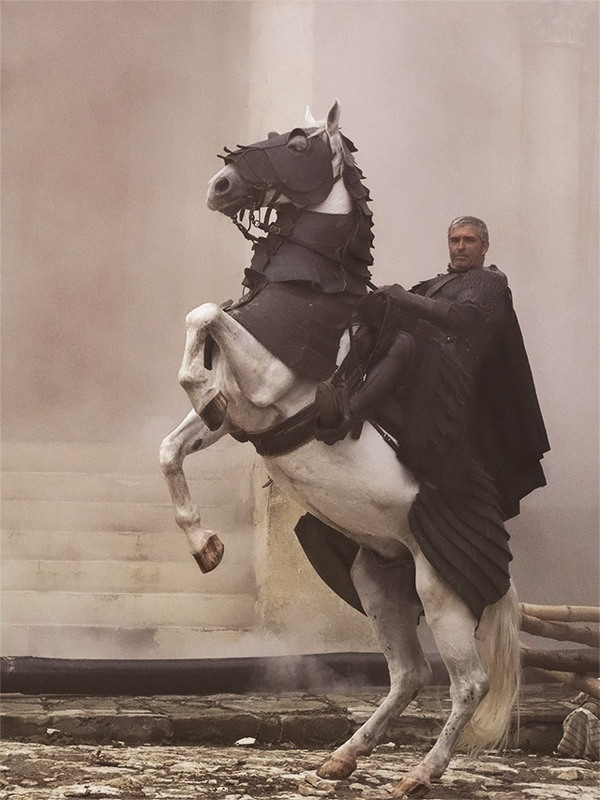 He won a recognition of his abilities to train horses with his appointment for horse trainer in the movie 300: Rise of an Empire (2014). One of the biggest challenges of the production was to find horses’ doubles that are to be rode by actors. This was practice, when filming movies outside Bulgaria but was applied for the first time in the country. Studying the work of the best horse trainers – Monty Roberts and Pat Parelli, Krasimir Simeonov reaches the conclusion that working with the horse in natural environment improves the quality, boosts the confidence between horse and rider and contributes to the strong leadership of man and horse’s willful submission to his rider. Daily workout and implementation of non-traditional for the Bulgarian riding school training approaches, led to the accumulation of invaluable experience in the training of horses, that vary in temper, abilities and talents. The latest stimulus of Krasimir was the appearance of his new partner in life – Tsvetelina Tsaneva. She is a CEO of the Bulgarian Association of Automobile Importers and since she was a child, her dream was to ride and be close to horses. And Fate joined them together. Tsvetelina is the biggest fan of Krasimir’s work and his best student. Her organizational talents and experience, in addition the common affection towards horses made Tzvetelina and Krasimir a great team both in life and on arena.